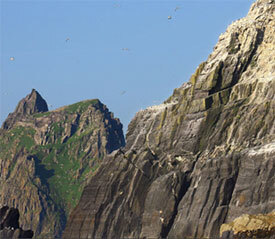 Duach King of west Munster, he took refuge at the Skelligs rock. When pursued by Aengus, King of Munster, Duach fled for his life to this isolated island off the Atlantic coast of Kerry. With the introduction of Christianity to Ireland came the founding of the monastery on the rock. Although it is not known who is the founder of the monastery, tradition gives it to St. Fionan. 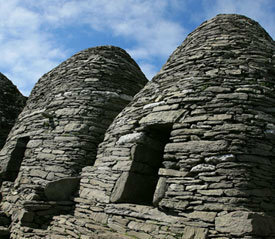 The monastery consisted of a small enclosure of stone huts and oratories, which still stand to this day on the island. Although isolated the Skelligs and its monks did not escape being attacked by the Vikings and in 795AD, the Skelligs was under attack from Scandinavia. Early Irish manuscripts give little information on these attacks. The Skelligs was again under attack from the Vikings and this time they took Eitgal, Abbot of Skelligs and starved him to death. These years saw the island once again being attacked. However, in spite of these attacks, the monastic community continued to live on the Skelligs and in 860AD some rebuilding was done. 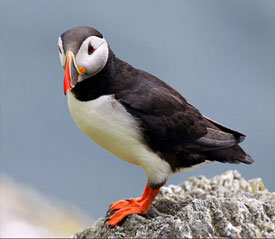 The life of the monks on the island is still much of a mystery. Unfortunately, few artifacts have been found to provide, information on the occupation of the Skelligs monastic community. 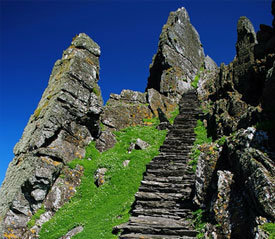 The Skelligs Michael (the bigger of the two islands) was a place of pilgrimage and penance for many years. In the 16th century it was a prime place of public penance. Two centuries later pilgrims were coming from all over Europe and Ireland at Easter-time to say the stations of the cross before finally kissing a stone carving over-hanging the sea at the ‘Needles Eye’. Many tales have been told about various pilgrims to the island; some funny, others serious, but all interesting. Over the years the nature of the pilgrims changed dramatically. The religious ceremonies were now almost attended entirely by girls and young men eligible for marriage. These couples instead of fasting went to the Skelligs to court, dance and have a good time. These goings on lead to the famous ‘Skelligs List’ which were both defamatory and humorous poems common all over Kerry and beyond in the 19th and early 20th century. Many of these poems can now be seen in the Archives of the Dept., of Irish Folklore in U.C.D.